I probably have slept 8 to 9 hours straight last Sunday after returning from Auburn, and on Monday and Tuesday I was feeling tired, thirsty, and quite blue. Lots of people gave me the “good job” and thumbs up “Like”, but slowly the excitement of witnessing an amazing race with many A-list runners faded and I felt down, spent. I had been really looking forward to this WS100 weekend, excited about pacing Mike – my trail running mentor. 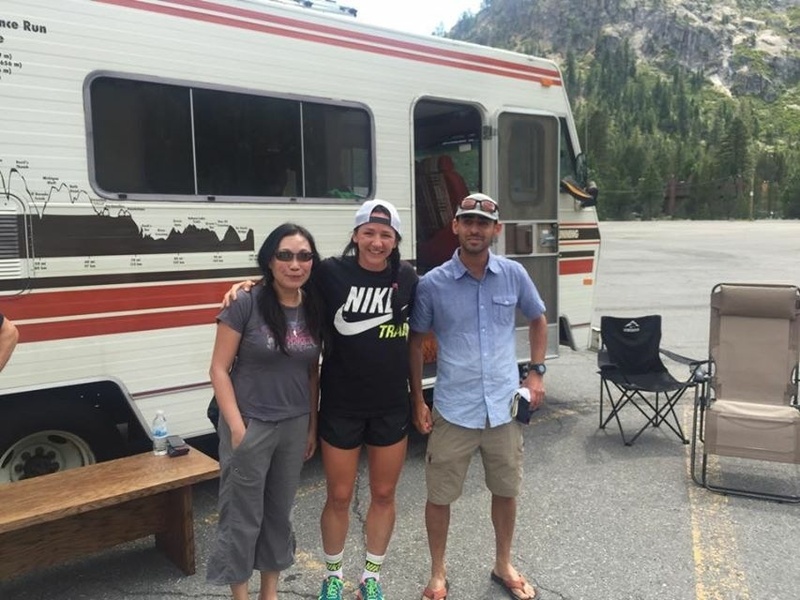 It was super exciting watching Rob Krar, Magdalena Boulet, D.Bo, Sally McRae..racing this epic ultra trail race, but nothing have prepared me that I would feel emotionally drained with guilt after experiencing WS100 from the inside. Friday, June 26th, Luc and I met up at 9:00am and he kindly offered me awesome espresso and showed me the crepes he had prepared for our road-trip. We picked up Kim on our way, and I jokingly posted “Pacers on their way to Squaw” on FB as we leaving Bay Area to dial-up the excitement that Mike must be feeling right now. Yes the three of us would be pacing Mike at Western States on Sat/Sun, which Luc and Kim did last year as well when Mike ran his first WS100. This year I am the extreme lucky one that get into this pacing team, and I knew way too well that it’s really not about me pacing Mike but instead Mike offering me an opportunity to experience WS100 from the inside. When I went up for the WS training run over the Memorial long weekend I thought about how lucky I am, and this is the best kind of offer a running girl can get except Kilian asking me out probably :-p But turned out that the whole WS100 experience is the best gift I ever received from a runner, a friend, and a mentor. We chatted about running, traveling..etc. 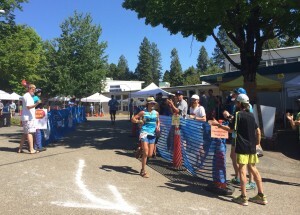 during the ride, and I asked about pacing tips particularly for Mike at WS100, and what I should do if we are off the target time, what if he is really hurt, and given that I am the last pacer what I should do if we are within few mins to our goal..? 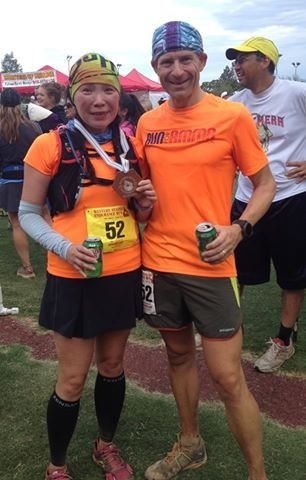 They both run with Mike for years and more often than I do, and they know when and how to push the button, and Kim even joked that “I am going to do what he did to me at Quicksilver (100K race that Mike paced him)” LOL… but Kim seriously warned me that “pushing too hard can destroy a runner’s race completely.” Luc told me not to worry too much, because by the time Mike and I unite at Hwy 49 there isn’t much I can do about saving his goal if Mike is behind. Then I worry about other things like getting lost, tripped and fell..etc. 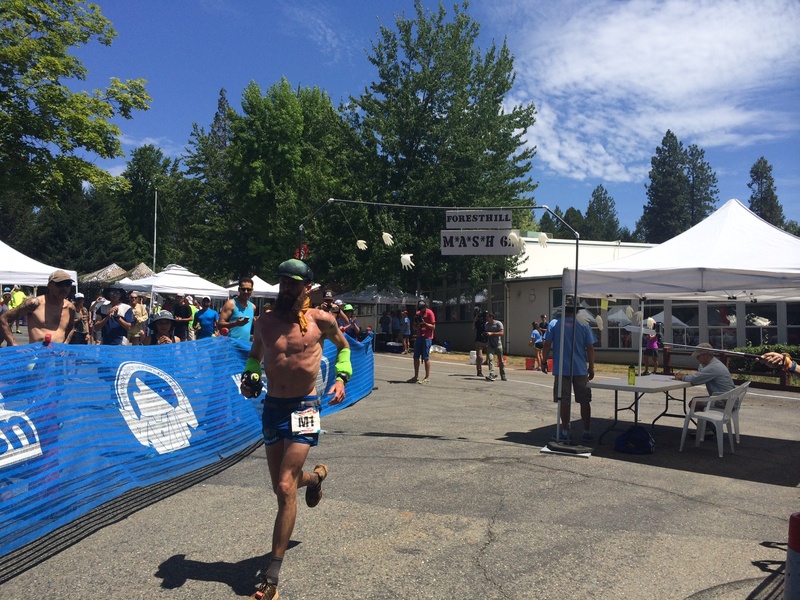 Pacing a very good ultra runner is a big deal, especially at Western States. I’ve been practicing running at night at Mission Peak on my own and I can confidently say that I am Ok with the technical terrains and running at 3:00am in the dark, but still when it’s less than 24 hours away I got nervous and worried. 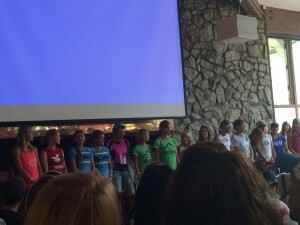 “The most difficult part of Western States is getting into the race, and those come to the start-line are the very brave ones” — I knew how hard it is to get an entry into WS100 and I also knew some have tried it for 6,7 years, but “coming to the start is brave“? That I thought was just typical pre-race pat talk, but after spending two days following so many runners chasing their goals I can’t agree more about how brave all the runners are. 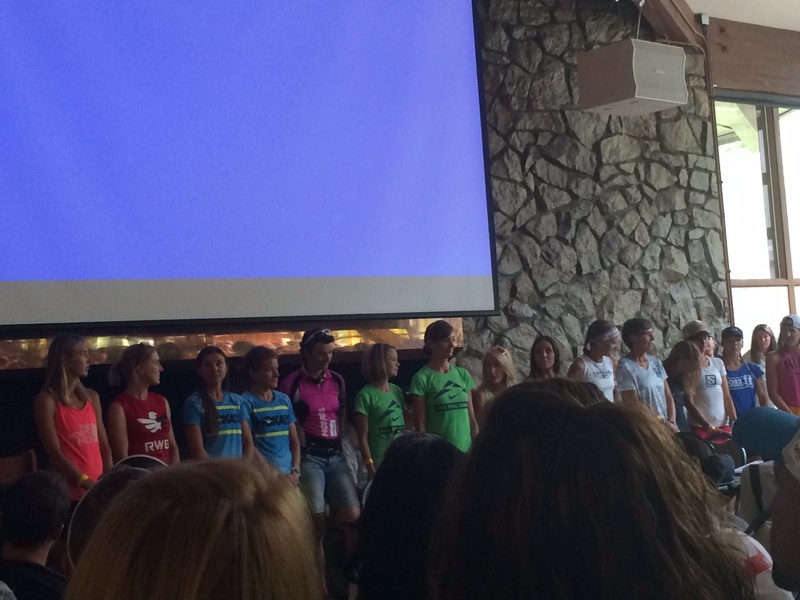 Now I truly admire those 371 that came to Squaw and toeing the start-line. I am very aware that I am not good enough to be at WS100, but even if I have the physical strength I doubt I would have the mental strength to dig deep and grind hard in order to complete that 100.2 miles. What movie does one watch as part of the pre-race ritual today?? “Unbreakable” !! Of course!! No better day than this, no better film than this! I got goosebumps watching all the runners going through so many highs and lows, and truly looked forward to the race in 9 hours. After the delicious family dinner, Mike showed me how he made the avocado turkey sandwich (wrap) for himself, and he went over the check lists and tasks with his A-team crew — wife and daughters. Definitely OCD to me :-p I am a very minimalist when it comes to races — destination races, international races, and even when I ran my TNF50, I carried my usual GU Brew, Roctane gels, and Japanese salted plums.. that’s about it. But of course this is 100 miles and this is the Western States, what do I know ?! 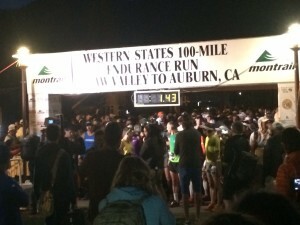 Sat June 27th, we all woke up around 3:00am and went to the 2015 Western States Endurance Run start-line at Squaw Valley. When Mike went to check himself in, we walked around the start-line and I didn’t know anyone here – not my territory :-p Trail races, especially Ultra, feel very different than road races. Runners are very fit, and have that rugged and free spirit look all over, and beard & tattoos are pretty common . I saw couple guys in flannel cotton shirts and wonder how they were going to run in those. I asked them and touched the fabric, wow.. so deceiving, the shirts were actually tech-t material. Luc and Kim teased me about my touching guy’s shirts. Hey, they were cute and couldn’t help it :-p I wanted to get a good look of runners taking off, so I walked into the trail and staring at that clock and elite runners at the front with excitement. Right on dot, the runners took off at 5:00am, and the crowd went wild!!! This was going to be a very long day, so we were going back to get more zzZZs. On our way back we did a little detour and got some croissants at Luc’s suggestion. I would be happy just to bite it as soon as I get my hands on those, but not for the French. He had to bake them and served with espresso. No complaint from me 😛 My original plan was going to volunteer at the Last Chance (mile 43) aid-station with the Stevens Creek Striders club like last year — the best aid-station ever, but Mike told me to stay at home and not to get dehydrated. The three of us took a nap, goofed around at his place, studied the pace chart, writing course profile & pace on arms with sharpie, and then ate more croissants — “I think we are going to OD on French pastry today” LOL! We left for Foresthill (mile 62) after our croissants lunch, and checked ourselves in at the Pacer Central around 1:30pm; then stood under the trees waiting for Elite runners to come in. The three of us all have T-mobile, which means we had no signal there and we wouldn’t know where Mike or the rest of the crews were. Someone asked me “how is Mike doing?” I must look puzzled because he then pointed at my pacer bib and said “you are Mike Kreaden’s pacer, right?” Apparently he had met Mike at that Wed party and he wasn’t the first person mentioned being at Mike’s party. Luc joked that it probably was a 300ppl party :-p At 2:18pm Rob Krar came in and jogged through the Foresthill aid-station, looking so relaxed and effortless; he didn’t stop for long except taking two bites of watermelon then he was gone. Looking at his strong running form, I couldn’t hide my admiration. About two minutes later Seth Swanson came in and he looked so good in person — very non-ultra runner look :-p This year’s WS100 has very competitive female runners and I think most of people betting Stephanie Howe would win again. So I was very ecstatic when I spotted Magda’s blue shirt and that really cool wicker hat which she got the idea from Rob Krar and Max King. 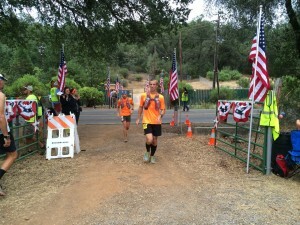 She walked through the aid station so calmly and wiped her neck with some ice-water, in-and-out in about a minute. “Stupid people” I spoke silently, because there were no cameras or crowds following her, but I bet Magda could care less about the cameras. She looked so focused!! I shouted “Go Magda” with my GU cowbell!! The only way we could follow Mike was by checking with “Where is my runner” at the aid-station, and we saw him was running slower than last year which we thought was good and was planned. But by the time his daughter came to Foresthill we were told that he wasn’t looking good and he couldn’t pee for hours. OMG, that didn’t sound good at all and I got really worried!! According to the pace chart Mike had mapped out, he was supposed to be here at 7:09pm with 15 to 20 mins margin, but now he was behind and not for reasons in plan. It was hot and we were tired standing around, so after Kim left to meet Mike, Luc and I joined Mike’s family to have pizza and soda in the nice and cool Sugar Pine Pizza, and free wifi!!! Got to love wifi, and finally we were able to check when Rob Krar would cross the finish line.. er, I mean, so we could check how Mike was doing :-p. The waitress kept coming back to us wanted to see if we needed anything (aka get your butts out), but we just kept staring at UltraLive on our phones. 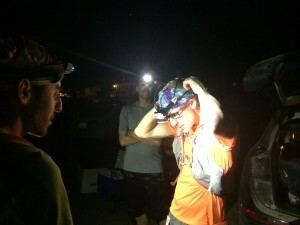 We learned that Mike had checked-in at Michigan Bluff (mile 55.7) at 7:09pm, and left at 7:56pm, so what was he doing in that 45 mins and why he stayed there for so long? We all wanted to know and worried, as it getting darker quickly and even though I sucked at Math big time I guessed the goal of hitting sub-24 hour was tough now. To ease everyone’s worry, Luc decided to run to Bath Road and meet with Mike before he came into Foresthill, so we could prepare his sandwich, fuel, battery for heart-rate monitor..etc ahead of time. It’s so dark now that we all turned on our headlamps for him and Kim to find us easily. A bit after 9:30pm he and Kim ran toward our cars and we all ganged up on him questioning how he was doing, needed anything?.. etc. And I was shocked to see how exhausted he looked and I couldn’t believe my ears when he said “I’m sorry Michele.” I was puzzled and still don’t understand where that sorry came from, and he certainly didn’t owe anyone apology! He left with Kim for Cal trail and looking better after meeting with the whole crew briefly, and now it’s time for us to adjust our plan accordingly since we were about 2hr and 30min behind and we had readjusted our goal to support Mike to get a PR (27 hr and 43 mins). Luc was supposed to pace him from Green Gate (mile 79.8) at 11:22pm, and me from Hwy 49 (mile 93.5) at 2:49am, with that 2hr and 30min adjustment, Mike wouldn’t be at Green Gate around 3:00am and my session wouldn’t start till after 5:30am. On our way to Squaw yesterday Luc was telling me that I would run through beautiful meadows and I got excited about seeing sunrise at Western States trail. Luc and Kim immediately went ” No No No” in sync, “no, you do not want to see sunrise this time.” Oh right, I was supposed to bring Mike in before 5:00am, so we Should Not see sunrise. But now it looked like I wouldn’t start till after the sun comes up. We went to the hotel that Mike had booked for us in Auburn, and hoping to catch some sleep. But Luc needed to drive to access Green Gate and there was going to be few miles of hike, therefore he just left with the crew captain Mariano around 10:30pm. I took a quick shower, laid out my running cloth and filled my hydration pack and went to bed. But I kept wondering how Mike was doing and his tired face and body stayed stubbornly in my head. I wasn’t able to sleep at all and every 20 or 30 mins I checked UltraLive and see how he was progressing. I set my alarm at 3:30am for my meeting with Mariano at 4:00am, so he could drive me to Cool and catch the shuttle to Highway 49 Crossing for pacer exchange. But by the time Mariano came, he sit down half-asleep and told me that we could wait for another hour because we wouldn’t see Mike till after 6:00am. That meant the PR would be very difficult to happen now. 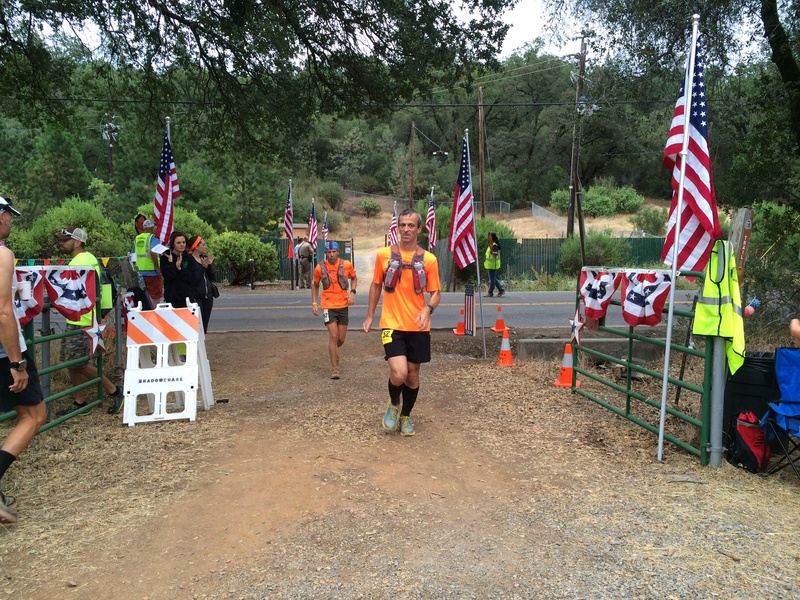 I’ve never run the Way Too Cool 50K Ultra, but that fire station is where the WTC50 starts. Thanks to the volunteer shuttling crews and pacers up and down that street all night, and as soon as I got off the school bus I saw quite a few people including Isaac sitting on the ground or lawn-chair and waiting. Not sure where he camped last night, but he was here to support his friend as well. Now I’ve learned that pacers and crews play a huge part in ultra trail race, and we are all in this together as a team with heart & soul. Mariano setup a chair and asked me to sit and rest, and I didn’t dare to tell him that I had only slept for about 30 mins. 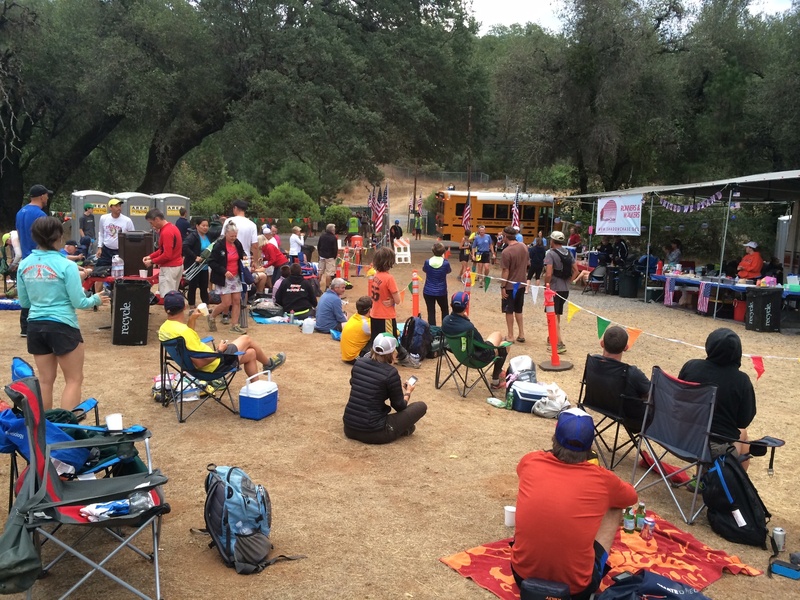 I didn’t want to complicate my stomach so didn’t touch any of the aid-station food here, though the volunteers offered me pancakes, bacons, scrambled eggs… and they all smelled sooooo good! Dark cloud hanging low in the sky and looked like a storm might come in, and I could feel some tiny drizzles on my face that actually felt refreshing as I was tired physically and mentally. I can’t imagine how Mike ran through the night after running the whole day in that canyon oven!! A little after 7:00am, I spotted two orange shirts coming down the hill on the other side of the road and in distance I thought that’s our Run for Amma shirt. All the runners look pretty much the same after running for so long, the dusted face, beards, calves-sleeves, hydration pack…etc. When the two of them entered the aid-station, Mariano and I walked up to greet them, and Mike sounded happy to see us “oh hey.. Michele! 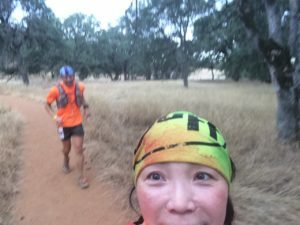 !” Then he asked Luc “how are we doing on time-wise?” Luc responded “we are right on target.” I wasn’t sure which “target” they were talking about now, with less than 7 miles to the finish, and I wondered if it’s the pacer lies I have learned about from Ultra podcast. I asked Luc “how is Mike?” He said “he is tired and his mind is a little off.” I gave Mike a hug and asked if he needed anything before we took off. Honestly I felt really bad seeing he looked so fragile and a bit solemn, and the weirdest thing was he had shrunk. That always strong, confident and intelligent Mike now looked beat-up, disoriented, and all wrinkled up. I don’t know how to describe that mixed feeling I had; on one hand I was so proud that he had made this far and I was so relieved to see him being ok, but on the other hand I don’t understand why would he put himself through this — letting a race stripping away your pride and confidence. We all become so small in front of the mountains. We crossed the No Hands Bridge (mile 96.8) and I saw the famous Christmas lights were taken down already; American River was running rapidly below us and the openness and view were just unbelievable. Mike told me we only had few miles left after one more big climb. He was running fast ahead of me and hiking up fast when that big climb coming up. On our way to Robie Point he was definitely pushing and pulling me, and he was more the pacer to me than me to him. We were doing about 10:30 min/ml pace and I was sweating like crazy. Approaching Robie Point I saw local residents standing and sitting to watch runners coming in, I opened my arms, flapping and gesturing them to clap and applaud — “Go Mike!” the locals cheered. 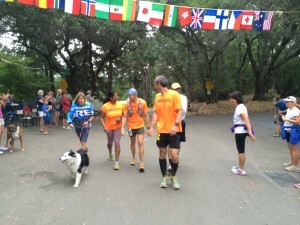 By the time we ran up the last incline, Mike’s coach Ann Trason (14 times WS winner) and her dog Zoey were there. 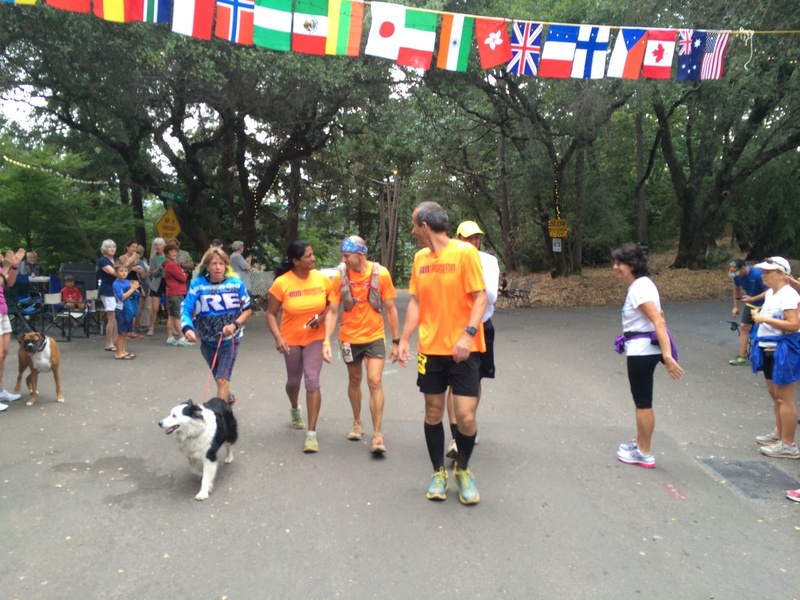 We walked together and soon we spotted the whole gang, our running friends from the Stevens Creek Strider and his wife Usha, were all here. I ran ahead of them to take pictures for the group, such amazing support and so much love!! We started running to the high school following the footprints on the road knowing we could possibly make it under 28hr, and we all sprinted on the track like real athletes — they don’t call this Victory Lap for no reason :-p Before the finishing chute coming up, we were directed to the right while Mike sprinted toward the finish line, with a big smile on his face! 28:01:46. The most unexpected and amazing thing happened at the finish, and this is going to be a moment that I will never ever forget for the rest of my life — Mike put his finisher medal around my neck, and I started to cry hard and ugly while surrounded by our Striders friends and families. I was surprised and confused, and I told him “no, I don’t deserve this; I can’t accept this.” I didn’t hear what he was saying when he hugged me because I was overwhelmed with gratitude and guilt. I appreciated how selfless and generous he has been, for bringing me to Western States, giving me a chance to run on the actual WS trails, showing me and guiding me how to run on those tough hills, and demonstrated how he was dead but came back alive multiple times strongly. But I can’t get rid of this guilty feeling that somehow I failed as his final pacer because I didn’t bring him in under 27:59:59. I couldn’t express or explain that feeling, but in my heart I thanked Mike again and again for everything he has done for me, during our runs and during course of my life. There was award ceremony after noon which we all attended, but Luc and I didn’t stay long since we got a long drive back home. Sunday night I crashed early and hard, and the whole day on Monday I was really depressed. I couldn’t stop questioning myself if there was anything I could have done to make that 27hr and 59min happen, and if there was anything I could help to produce a PR for Mike. I probably was being very Monday night quarterback, but the agony was driving me crazy. Tuesday I went for a run in the morning hoping that would cure my depression but didn’t help much. Then I decided that a talk with Mike was needed, and I got to get the guilt off my chest by making confession. I knew Mike had given up ice-cream while training for Western States and he loves ice-cream, so I managed to get 4 pints of Bi-Rite ice-cream from SF and brought over to him on Tue night. The moment that I saw him bringing out trash and talking to his neighbor looking all normal I felt relieved, and during dinner he shared some of his WS moments and he was talking and looking happy. The tired and beat-up Mike was gone and the confident and strong Mike is back. Yeh!! I confessed my miserable feeling and apologized my failing him, but he simply brushed me off and said it’s time to move on and apply lessons learned from two WS100s. So he is going to do it again, huh!!! That’s my mentor, my hero!! Now after this WS100 experience from inside, I asked myself if I would ever try anything like this? The answer is I am not that strong, and even if I have the legs I don’t have the heart. I can’t see how I can bounce back after emotion naked and confidence stripped, and I can’t handle being repeatedly defeated. That’s the weakness I discovered about myself. For all the runners that were ever in WS100, won, finished, dropped, DNFed, or tried but didn’t get in… you all are the brave ones!